Find the "Math" (which is American for Maths) entry (about halfway down the list). Click on the plus sybol, and some sub entries should appear. 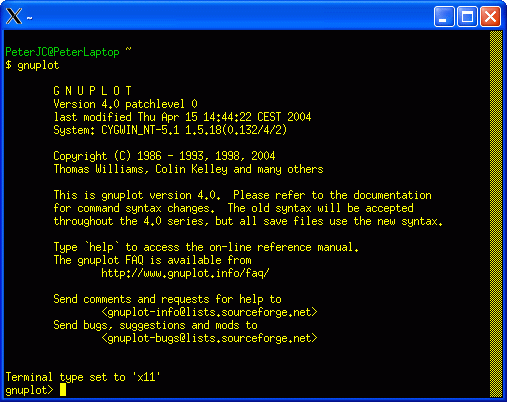 Find the "gnuplot" entry and click on the text "Default" which should change to say "install"
Click on the next button, and let Cygwin download and install gnuplot. At the prompt, type gnuplot and press enter. 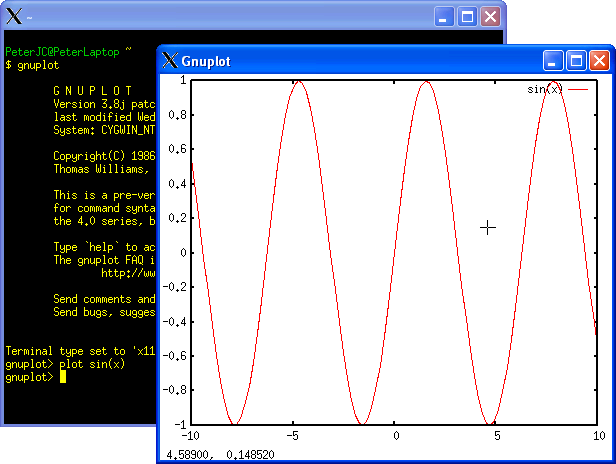 At the gnuplot prompt, try typing plot sin(x) and press enter. Try resizing the graph window, and maximising it. Notice it will automatically resize. Try zooming in by using the right mouse button. Try typing splot x*x-y*y and press enter. The command splot (special plot?) is used for 3D graphs, in this case f(x,y) = x^2 - y^2. Again try resizing the graph window. Try rotating the figure using the left mouse button (left click and move the mouse left and right). Try adjusting the viewpoint using the left mouse button (left click and move the mouse up and down). Try adjusting the vertical scale using the middle mouse button (middle click and move the mouse up and down). Try zooming by using the middle mouse button (middle click and move the mouse left and right). 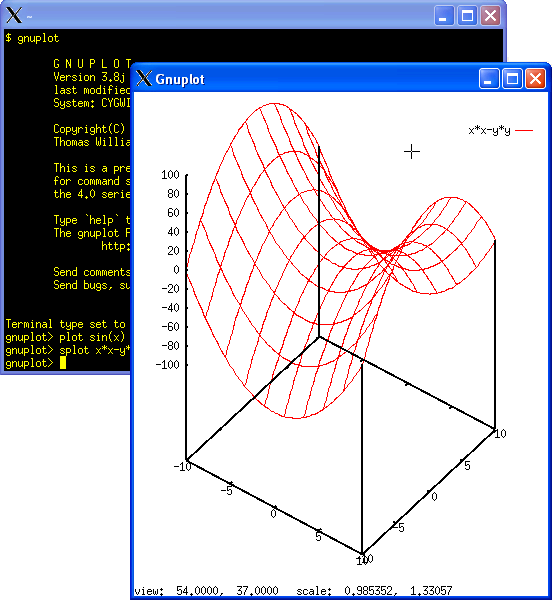 Type "exit" at the gnuplot prompt to exit the gnuplot program. For more help using gnuplot interactively like this, I suggest you turn to Google. There is also more documentation at the official home page, www.gnuplot.info. 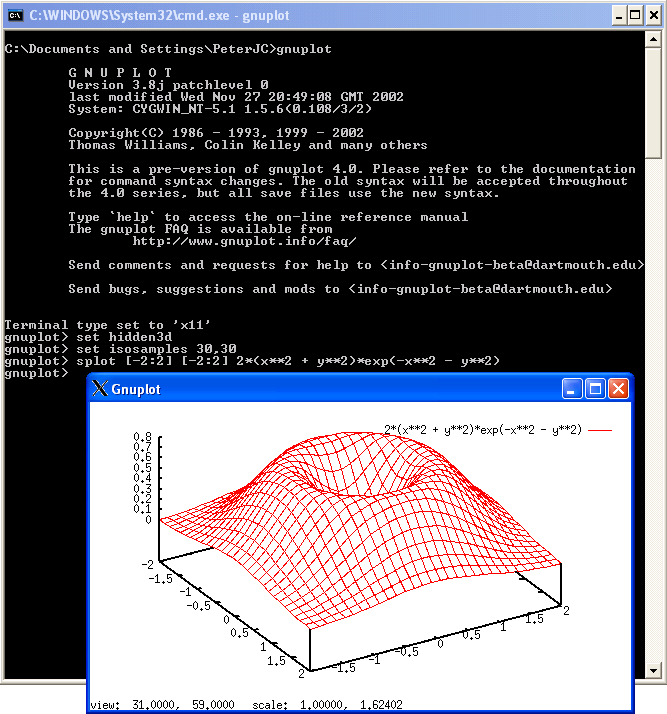 Next up, Part Six - Using gnuplot from a C++ Program.